Welcome to the first guest post from our new partner, the amazing Way of Cats blog. If you think you knew a lot about cats, wait till you check out the incredible wealth of knowledge blog creator Pamela Merritt (aka WereBear) shares with cat lovers of the world! One example is in her article on what she calls the Paw of Compassion. Have you ever had a cat connect to you in this way? It is a magical feeling when an empathetic cat or kitten reaches out and lets you know they are there, and in tune with you! 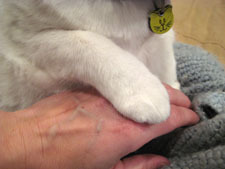 The Way of Cats blog says, “When we have a good cat relationship, our cats will extend the Paw of Compassion. Sometimes this is literal, as when they lay their paw on our arm or leg. Sometimes it’s a head rubbed across our cheek or forehead, sometimes it’s curling up near us. But our cats do seem moved to comfort us when they know we are down. How do they know? Cats have many skills which help them sense our moods. Matching brain structures. A cat’s limbic system is considered very similar to our own human ones. This is the part of the brain which connects emotion with our thought processes. This is why science is working on an electronic simulation of a cat’s brain. While small, it is powerful, and a good model to understand human brains. Compatible emotional range. Cats and humans have neurological, hormonal, and genetic makeups which are far more alike than they are different. There are many explanations to delineate the gradations between us, as in this thoughtful essay, but it is necessarily a difference of degree, not of kind. Grief has also been observed in many wild species following the death of a mate, parent, offspring or pack-mate. Feline grief at the death of a long-term human or feline companion can include severe mental disturbance. Grief varies according to the individuals and some cats show little grief while others can be deeply traumatized. This variability leads some scientists to insist that observation of grief in cats is anthropomorphism on the part of the owner. Such scientists forget, or ignore, that fact that humans are equally variable in how they express grief. I continue to think all mammals who live in a social structure tend to react in similar, and mutually understandable, ways. Shared social environment. Our cats are used to, at the very least, evaluating our behavior and seeing how it impacts their needs. There might be an element of selfishness in our cat’s strong interest in our moods; but no more than it would be for our own children, partners, or friends who rely on our mutual assistance for physical or emotional needs. Cats have many uses, as I write about in But Cats Don’t Do Anything! Cats require strong interaction with our day to day routine to be happiest. Nicely enough, this results in our being happy too, since we have a little someone or someones who notice our moods and try to be of service. They can clown or cuddle, depending on their personality and our needs. Anyone with a close cat relationship has a story about how their cats gather around when they are sick or sad. Under such circumstances, it’s undeniable that our cats are concerned. We can argue if this is because they are worried about us, or worried about how this might impact tonight’s dinner time. There’s more ways to get our cat to be affectionate in The Way of Cats than the article you are reading now. See all of the Way of Cat’s CAT AFFECTION posts.